MiniArt is back with an interesting new kit. This is the Caterpillar D4 bulldozer circa World War II as used by US military forces around the world. 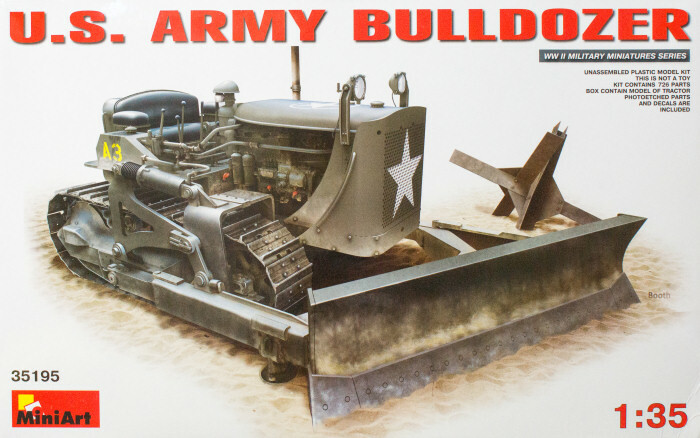 These bulldozers were used extensively by US Army engineers and the US Navy Construction Battalion (Seebees) to carve out roads, base perimeters, runways, and other essential earth moving duties needed to support combat operations. These D4 dozers have the signature earth-moving blade and are smaller versions of other Caterpillar models like the D7. This dozer had a hydraulic lift to raise the dozer blade between pushes/cuts and was driven by a four-cylinder 40 horsepower-class diesel engine. While the D4 was used by the US military and its allies during World War II, the D4 started production in 1936 and remained in production (with incremental improvements) through 1996. This kit is molded in light gray styrene and presented on 21 parts trees plus one tree of clear parts and one small fret of photo-etched details. Considering that this is a very small model in 1/35 scale consisting of over 700 parts, you can see that this is quite a detailed model. There are a significant number of small parts which might make this kit more complex than it really needs to be. This kit is a beauty and offers the experienced modeler with some breathtaking details plus an excellent opportunity for weathering. This kit has over 700 parts in the box for a subject that isn't much larger than a small truck, so this won't be a weekend build nor is it recommended for modelers that are not comfortable working with lots of tiny parts. If you're looking for a different kind of tracked project for your bench, look no further!